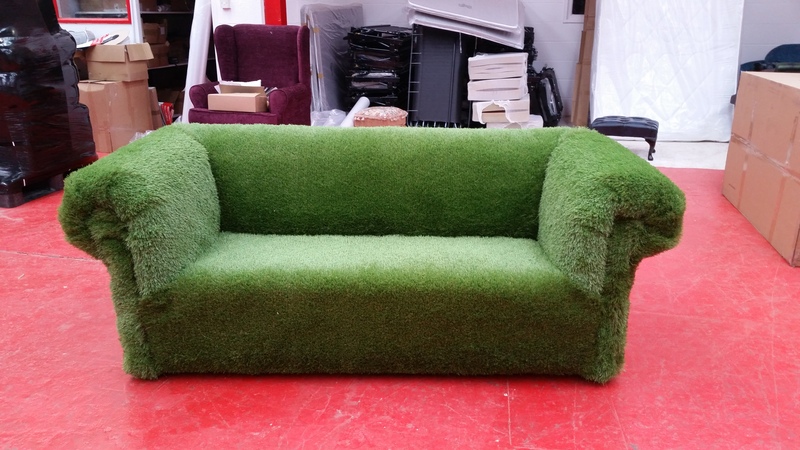 Our specialist furniture manufacturers we’re asked to put their skills to the test when we were approached to design and produce a sofa made out of grass for an eco-friendly event. Our skilled furniture manufacturers were more than up for the challenge, and ended up with this breathtaking piece of green furniture, in every sense of the word. Desig­ner­Sofas4U support eco-initiatives, going as far as to employ our own initiatives to reduce our carbon footprint as much as possible. We were honored to create this piece for the event, as it tapped into our own passions for furniture and the preservation of our planet. We source our wood from sustainable sources, and import the finest leathers and fabrics from respectable and reliable sources. We also employ a fair trade policy at Desig­ner­Sofas4U, and we regularly visit our worldwide suppliers to monitor fair trade practices and work hand-in-hand to further develop best practices. This helps us develop long-term business relationships with our suppliers, helping to make sure that our partners provide everything from fair wages to environmental awareness and respon­sibility for all of their employees. If you have questions you’d like answering about our fair trade and eco-friendly green initiatives then don’t hesitate to contact a member of our customer service department. You can email, call 01254268 590 or fill out our contact us form today.